You know how sometimes you just NEED ice cream? Or chocolate? After midnight? Yeah, me too. When I was hit with the craving recently, Google took me to ice cream maven David Lebovitz's website, where of course he had the perfect solution. 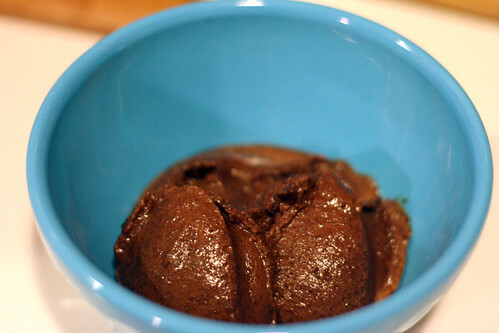 I whipped up this chocolate sherbet and had it churning in no time flat, which was key at that hour (essential summer tip: store the bowl of your ice cream maker in the freezer at all times in case of emergency!). You can probably see hints of my impatience (hello chocolate soup) in the photo. I made a silly error that involved adding the cocoa powder a step later than the original recipe called for, but it came out so well that I've adapted the recipe to show my happy mistake. 1. Warm half of the milk with the sugar and salt in a medium saucepan over medium-high heat. 2. Bring to a full boil while whisking, then reduce the heat and simmer gently for 30 seconds. 3. Remove from heat and add the chocolate, cocoa powder, vanilla, and the liqueur, if using. Stir in the other half of the milk. 4. Chill thoroughly, then freeze in your ice cream maker according to the manufacturer's instructions.